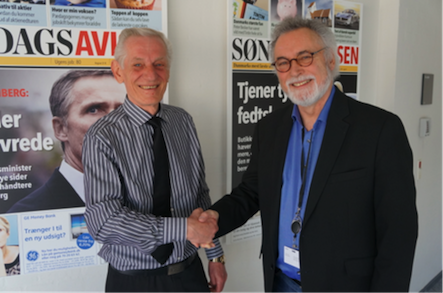 North Media A/S, Denmark’s only listed media group, has chosen WebProof as its future ad-management system for its portfolio of more than 30 newspapers, including Denmark’s most-read, weekly newspaper: “Søndagsavisen“. North Media’s CTO, Preben Runge, congratulates Jan Adeltoft, co-founder of WebProof. ‘In addition, WebProof is 100% web-based, which means it does not require any plug-ins such as Flash or Java, the only requirement being internet access. Finally, we talk to users similar to us and had very positive feedback. North Media, which has more than 500 employees and annual revenue of 150 mio. €, produces and distributes an impressive list of local and national newspapers in Denmark. North Media’s also operates online service platforms and ad services such as Ofir.dk, Boligportal.dk, Bostadsportal.se, MinReklame.dk, Byggestart.dk,HentTilbud.dk as well as the distribution division FK Distribution. WebProof and North Media are well matched, since both companies are built on the mission of optimising traditional workflows. With a strong focus on cost-effectiveness, North Media aims to be market leader in its core business areas, and with Søndagsavisen as the flagship of the corporation, there is no question – they are in the running. WebProof enables North Media to reduce costs even further, by optimising the workflow surrounding the ads through using LEANprinciples. As an example, WebProof enables corrections from both the advertisers and producer to be made directly in InDesign, which cuts both time spent and production costs for many clients. WebProof, who recently received a Gazelle award from the Danish Newspaper Børsen, is recognised in the printing business as industry standard for proofing. WebProof’s online proofing platform enables companies to reduce costs and time spent, plus provides a valuable overview for everyone involved in the process. In addition to the proofing platform, WebProof provides a highly advanced workflow, which has optimised many large companies’ graphic productions. WebProof has over 50,000 users in more than 100 countries. Customers such as The LEGO Group, Bang & Olufsen, Toys”R”Us, Coop, ICA and countless media groups and advertising agencies approve more than over 5 million pages and ads every year. By choosing WebProof, North Media joins an already-impressive list of international media groups – such as Mecom (UK) and Edda Media (Norway), to name just two – which also use WebProof to automate and optimise their ad handling, online correction and much more.